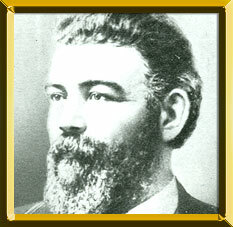 A poor Irish immigrant, John Morrissey grew up in Troy, New York. He was allowed one year of school before becoming a manual laborer. Head of a gang of young toughs, Morrissey had frequent run-ins with the police—an inauspicious start for a man who later became a U.S. congressman. After Morrissey took a bartending job in Troy, his boss tried to arrange a boxing match between Morrissey and “Dutch” Charlie Duane. When the young fighter went to New York City to challenge Duane at a Tammany Hall hangout, he was badly beaten by the unfriendly crowd. Morrissey stayed in the city, however, as a hired bully, enforcing the political loyalty of recent immigrants. Morrissey was dubbed “Old Smoke,” when he and another “immigrant runner” knocked over a coal stove in a saloon fight and Morrissey was pinned to the burning embers before going on to win. Thompson, then the California champion. Thompson had the upper hand, but when Morrissey’s supporters brandished weapons, he fouled Morrissey in the twelfth round to forfeit the match. Morrissey then returned to New York to challenge veteran fighter Yankee Sullivan. The fight was held at Boston Corners where New York, Connecticut, and Massachusetts meet, to stymie state authorities who might try to halt the match. Sullivan was 41, and Morrissey just 22, but for 37 rounds, the quicker and more scientific Sullivan thrashed Morrissey, who displayed his great ability to absorb a beating. Then onlookers stormed the ring. When the fighters were called to come to scratch for the 38th round, Sullivan was fending off Morrissey’s second, Orville (Awful) Gardner. The referee gave Morrissey the fight, in violation of a rule of that day which stated a fight must be stopped until the ring was clear. Morrissey parlayed his “win” into starting a bar and a gambling house. He used his connections to avoid convictions for shooting two waiters, three separate charges of assault with intent to kill, and possible involvement in the murder of a political foe. In 1858, Morrissey faced another Troy native son, John C. (Benicia Boy) Heenan, for what was considered the American heavyweight championship. Heenan fought well but was suffering from an earlier leg injury, and also broke his hand on a corner post during the fight. He collapsed in the eleventh round. Morrissey then retired from the ring. He opened a gambling house and then a racetrack in Saratoga Springs, New York, helping to establish the town as a popular resort and horse racing center. He later testified against Tammany Hall political leader, Boss Tweed, which helped speed the breakup of his organization. Morrissey was elected to two terms in Congress and two in the New York State Senate before his death in 1878. Excerpted with permission from 'The Boxing Register' by James B. Roberts and Alexander G. Skutt, copyright © 1999 by McBooks Press. All rights reserved.